you should have come over and cut vents for me in my already-baked pie. i kid i kid! it sounds like a nice, chill day, good blogging material or not. i hope glam is OK. :T. boss was in a similar predicament, and she made it to 38 weeks, so i will send the vibes i sent to bosswoman glam's way. 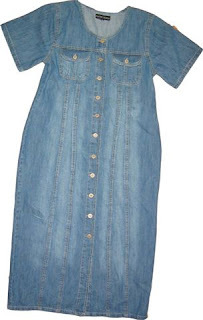 Denim dresses are required in a teacher's closet. It's one of the reasons why I must quit. Stat. Maybe the older denim dress lady just watched Project Runway *shrug* Some of those denim dresses were cute. I am angry at Glam's cervix, now is not the time to become incompetent! between you and jenn, you guys really are living 'the office', aren't you? too funny. i really hope glam and her baby are alright. i can't even imagine how scary this must be. lots of good wishes to her and the baby. I was wondering why you were so active on the boards during "work hours" yesterday. positive thoughts for glam and baby glam! Denim dresses?! I would have been laughing too. BTW, your lunch sounds good even if it was cafeteria food. What is it about capri pants that cause such controversy at law offices? An attorney at my office once got sent home for wearing capris. Then there was a "Caprigate" scandal amongst the clerks resulting in much backstabbing and gossip. As a non-capri wearer, it provides much amusement to me. Still sending good vibes for Glam. Sound like what my SIL went through with Liam before he was born. So I'm wishing her and her baby the best that the baby stays in there as long as possible!! P.S I'm telling your secret santa next year to send you that denim dress instead. lots of healthy baby dust to glam! i wore a denim dress the day the kid was born. it was as fugly as the one you posted. hey, it was the '90s. i remember the cafeteria at your office. it was quite a trek from my little corner, but it was always worth it. SNORTING at that dress. and thinking good thoughts for baby glam. How did you sneak into my closet to snap that photo of my denim dress?!!! Pretty damn resourceful little monkey managing to sneak past me as I lay in bed. BTW, if you think your day was boring. . . try a 5 hour power outage for "scheduled maintenance" while on bed rest! No Internet, no TV. . . My hubby has never received a warmer welcome home! Crab cake sandwich??? Yes, please!